Cats vs Dogs Charm Bracelet! Its the epic battle!! Cats vs Dogs! Which side are you on? 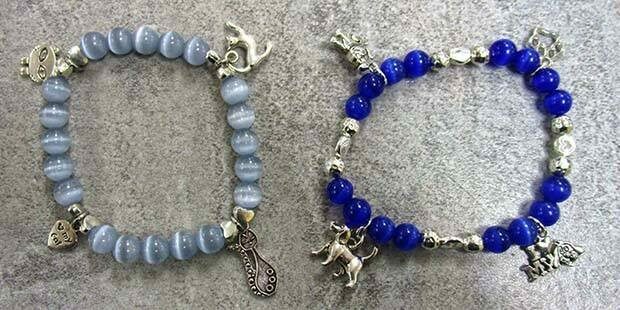 In this Make & Take you will be guided through creating a super cute Cat or Dog Charm Bracelet! You choose which pet you love the most! Make one for yourself or come in and make a gift for that friend or family member who absolutely loves animals! Studies have shown that just watching pet videos on the internet can boost a person's energy and create positive emotions—so it's no surprise that actual pet ownership has been shown to have numerous benefits! Keeping a cat or a dog as a pet is said to lower stress levels, help you sleep, are easy to care for, make lovely companions and are great alarm clocks! You will be able to use our bead design boards, tools, and basic supplies free of charge!